One of my favorite times of the year is here! Easter. For me that means family, fun, reflection and sweet times. Growing up, we always did the traditional hard boiled eggs, cascarones, and Easter baskets at my house. I kept those traditions alive with the niece and nephews but now that they are older, I concentrate more on bringing in sweet treats that I can prepare for the entire family. Sometimes our large extended family gets together for Easter but most times it is just me, my parents and my sister and her family. Lucky for me, every family member loves my desserts. When I was at Walmart last week, I had to go through their seasonal aisle. 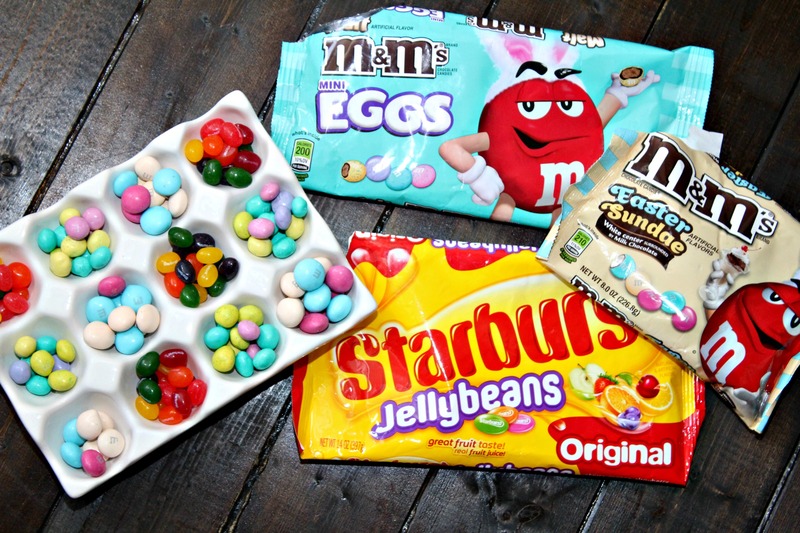 Once I saw these M&M’s® Easter Sundae flavor candies, M&M’s® Mini Malt Eggs and Starburst® Jellybeans, I had to get a bag of each. Jellybeans are my obsession. 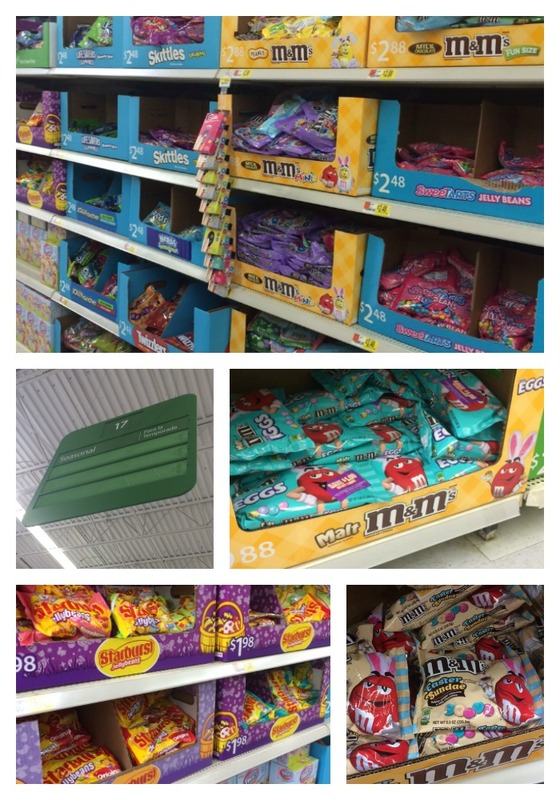 And the M&M’s® Easter Sundae variety can only be found at Walmart for a limited time so head on over there. And lucky for you there are coupons you can use to stock up on your favorite candy! 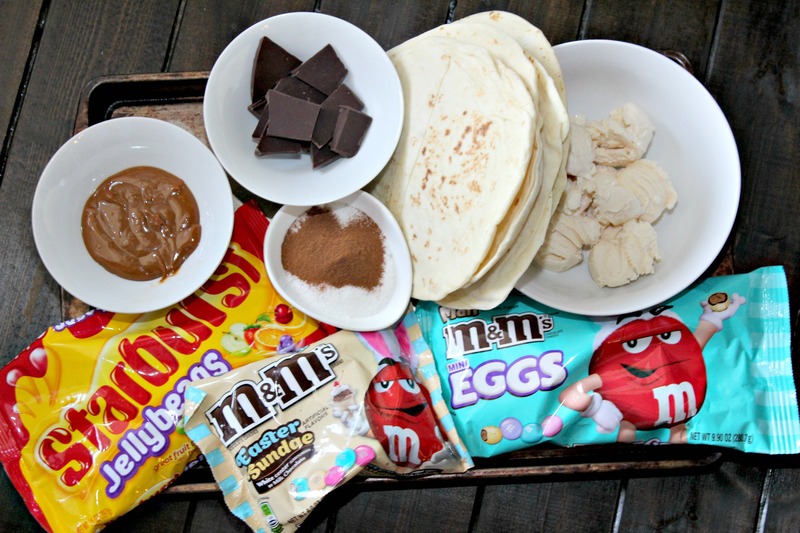 Be sure and try the M&M’s® varieties with Easter colors and the DOVE® Chocolate Eggs too! 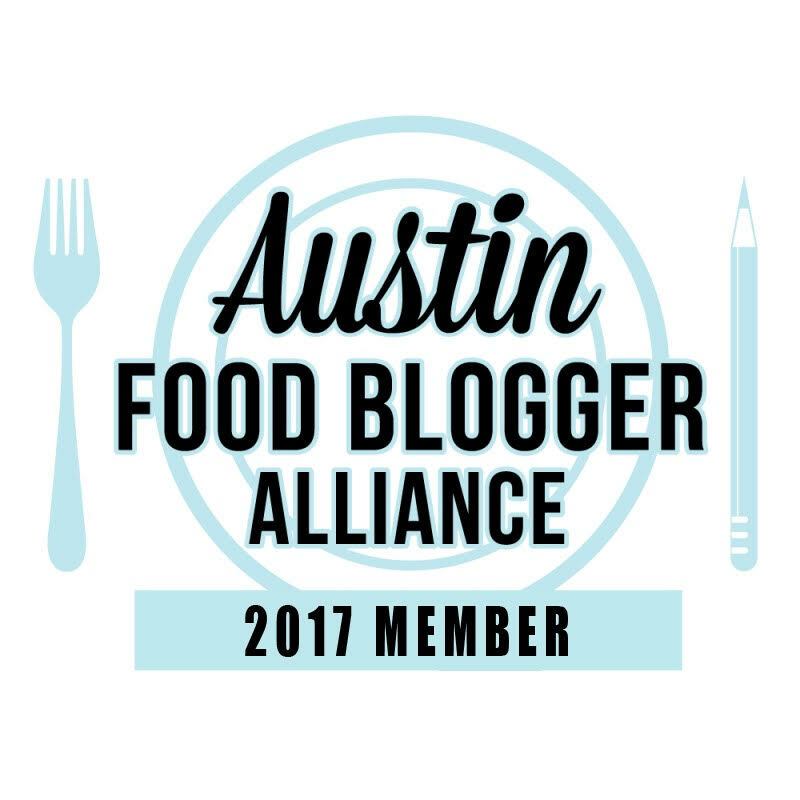 Visit the #SweeterPascua website to get ideas for sweet treats and a coupon. I missed making Buñuelos with my mom at the beginning of the year so for this holiday, I thought I would incorporate a version of them with this dessert. 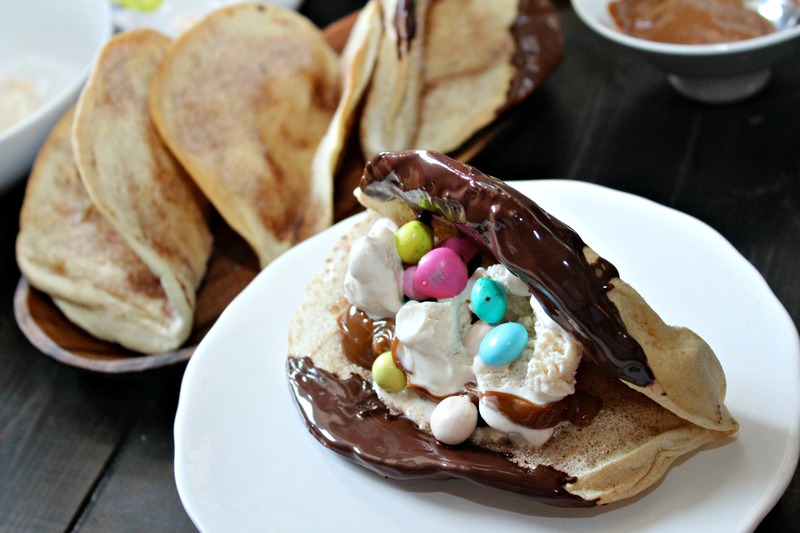 Fried tortillas are covered in cinnamon sugar then topped with your favorite chocolate candies, ice cream, dulce de leche or whipped cream. 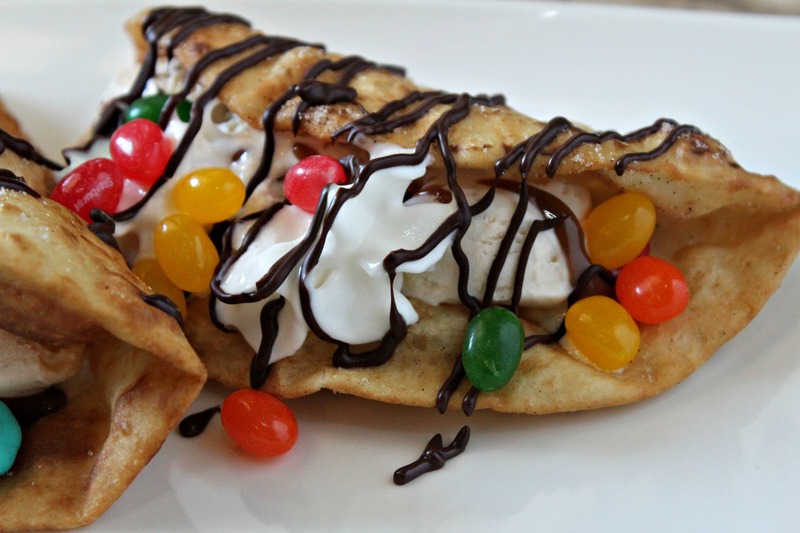 The surprise is the M&M’s® and Jellybeans added as a topping to give it an extra kick. When you bite into those little bites of chocolatey and sweet goodness, it’s like a burst of sunshine in your mouth. Add canola oil to a large cast iron skillet. Add enough for oil to come up about 3/4 inch from bottom. Heat oil over medium high heat until ready to fry tortillas. Add one tortilla at a time and fry for a few seconds on one side. Flip tortilla over with tongs and bring one side up to form a taco shell. Bring other side up and repeat the process. Remove and place on a paper towel covered cookie sheet to drain. Mix together sugar and cinnamon. Sprinkle over tortillas while still hot. Melt chocolate with butter over a double broiler. 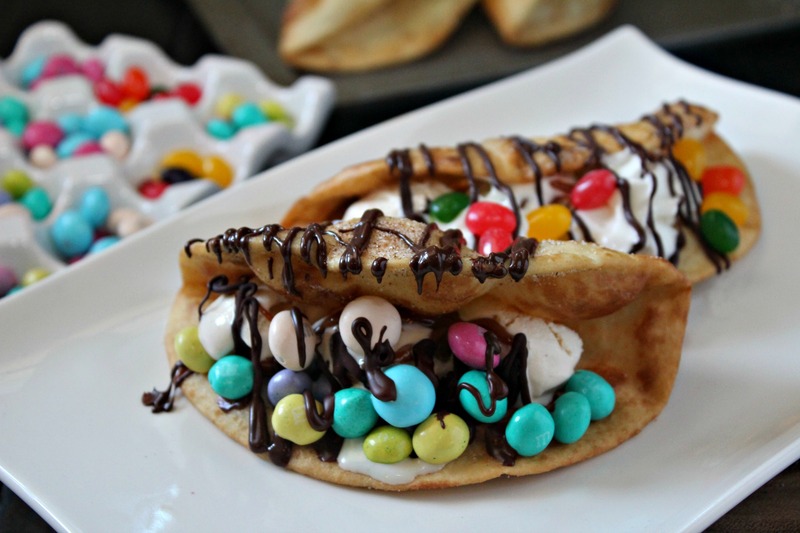 Make the tacos by adding ice cream, Dulce de Leche, whipped cream and candies. 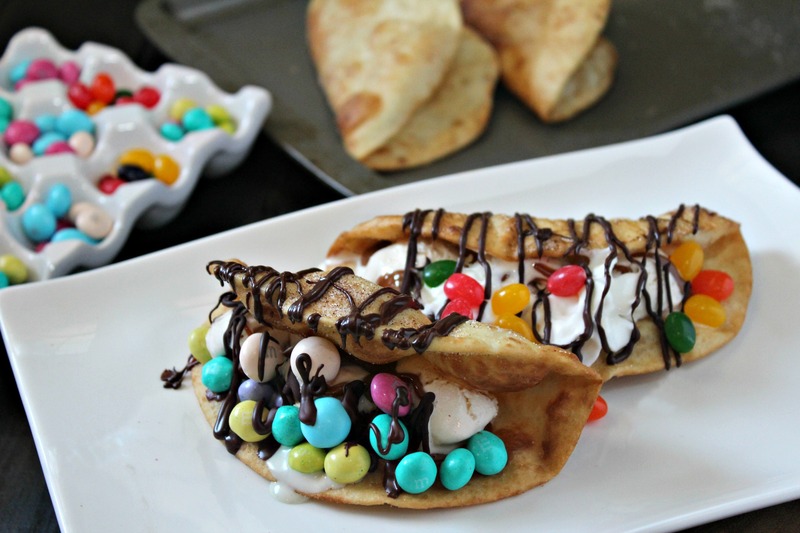 Drizzle with chocolate all over the taco.